Sorry for the bad quality of the photo, but Brian took it with my cell phone. It's stopped raining today, so I'll try to get a better one. I also take no blame for it being parked sideways. Brian did it and it was when I went out to yell at him that he took this photo. It does fit though! 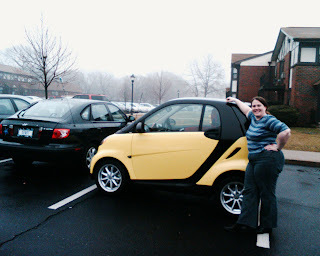 (And the black car beside it is our Elantra, so we would have been able to get out had someone parked "behind" bumblebee.) 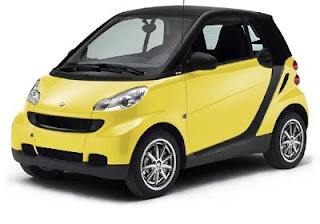 Oh, and for my European visitors who might be a little confused about my needing to "adopt" a Smart, they've only just gone on sale in the US last month. And they had thirty thousand pre-orders for them... They're going to be hard to get for a little while! So, remember that last blog post about talking to the dealer Tuesday night about getting on the list for an orphan Smart? Guess who called Wednesday at lunch time? I just about had a coniption fit at work being stuck there. We got all the financing in order and picked Bumblebee up last night. Photos once it stops raining (or I get the one I took with my cell phone camera). For all we would both desperately love for it to be adoption papers for a child of our own, that can't happen for years yet. As I discovered last week, we could adopt, but we couldn't bring the child into the US for at least another 5 years because of yet another $%$!#@$ in the immigration system. You cannot bring a child into the US through adoption unless you're a citizen. So there goes that option for us. And I already knew we can't adopt a child from within the US unless we're citizens. Can I just say how sick I am of this whole mess of a system? But I am thrilled about my Smart! We did preorder one, and are still in the wait for it. Unfortunately because we did the smart thing financially and waited to put in a deposit on it, we're waaaay down the list. The best estimate to get the one we ordered is 8 months. So we're now on the orphan list for one still in my colours and with my basic options. (Passion coupe with heated seats!! and no hideous tachometer bubbles) The one we ordered has more than that, but those are my two basic requirements. And at this rate, I'll have a significant downpayment made before we go sign for the car! E. Gary Gygax has passed away. May he live eternally in gamers' hearts. E. Gary Gygax has passed away. May he live eternally in all gamers' hearts.